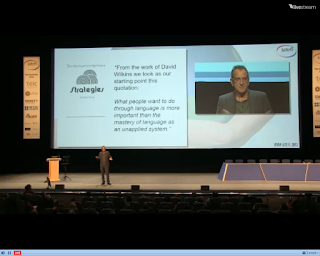 I called my post on David Crystal's plenary session A Blast from the Past - had I known what Scott Thornbury would be saying this morning, I might have saved the title for this one. Thornbury started his talk, 1966 and all that, by giving a detailed run-through of developments in language teaching since 1966, saying that he had started teaching EFL in 1975 and talking about what ideas were current at the time, the coursebooks being used, and how things changed between the 60s and the 80s. As I started in 1974, everything he was saying was - well, a blast from the past. The coursebooks he mentioned were all those I had used early in my teaching career, and Strategies, the book that he mentioned as reflecting the first step in the communicative revolution (Abbs, Ayton and Freebairn, Longman, 1975) is one that still sits on my bookshelf. Thornbury was looking at two different approaches to teaching EFL - the atomistic, linear, accuracy based approach exemplified in the structural approaches of the 60s, where "Grammar McNuggets" (Thornbury's own term) controlled the syllabus and were seen as the main aim of learning, and the more holistic, communicative approach introduced in the 70s, where communicative competence (rather than merely linguistic competence) and fluency were paramount. Yet, as he showed, little of the original communicative approach has survived, and the influence of the linear grammatical syllabus is as strong as ever. Thornbury was excellent (and also highly entertaining) in his analysis of developments in the sixties and seventies but paid less attention to later developments. I'd have liked to see some attention paid to the 80s and 90s, and indeed later. In a review of the last fifty years of TEFL, surely the learning vs aquisition debate deserves a mention, and concepts such as "noticing". Learning vs Acquisition was implicit in much of what he was saying, but could have been made far more explicit. I would have liked a more balanced discussion too. He reported the findings of a survey that he'd done, and made fun of those people who had said they believed that SLA researchers were simply wrong in saying that grammar is not the basis of fluency, comparing them to people who insisted the Earth was flat. But is it that simple? The survey had pushed them into a yes/no response, leaving no chance for any other position. Personally, as someone who has acquired rather than learnt Italian, I know that my fluency is affected far more by lack of grammar than anything else. I may know all the lexis I need, I'm just not sure how to formulate what I want to say grammatically. Maybe a few Italian lessons focusing on "grammar McNuggets" would have helped? I'm afraid I'm always suspicious of either/or approaches, and Thornbury in fact finished by attempting to present what he considered as a "synthesis" of approaches. He gave two examples, one of learning languages by the Language Learning in the Wild approach - where the learner is sent out of the classroom to fulfill specific tasks (eg buying something) in the community, and the second of some children in Gaza doing a version of the classic communicative activity Describe and Draw with a native speaker on skype. Both looked great, but Thornbury's emphasis remained on the task-based, acquisitional aspects. An explicit account of how the synthesis occurred never, unfortunately, emerged. OK, I know how it would happen if I was using the activities, and how my emphasis would be different if I was working with the adults in the Learning in the Wild example and the kids in the Describe and Draw clip but I wonder if it was clear to everyone listening? 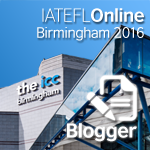 Want to see other IATEFL posts?